Monitoring the environment by making repeated measurements through time is essential to evaluate and track the health of ecosystems (fig. 1). Long-term datasets produced by such monitoring are indispensable for evaluating the effectiveness of environmental legislation and for designing mitigation strategies to address environmental changes in an era when human activities are altering the environment locally and globally. 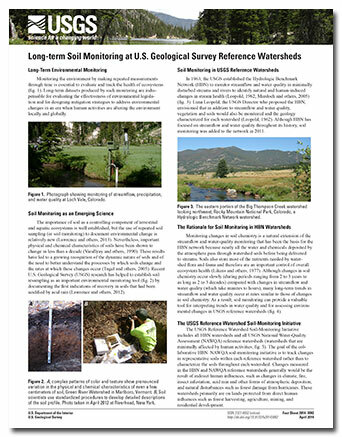 McHale, M.R., Siemion, Jason, Lawrence, G.B., and Mast, M.A., 2014, Long-term soil monitoring at U.S. Geological Survey reference watersheds: U.S. Geological Survey Fact Sheet 2014-3002, 2 p., https://dx.doi.org/10.3133/fs20143002.